Bureau B kick off their reissue scheme for Düsseldorf's legendary Ata Tak label with this lost classic of NDW pop. 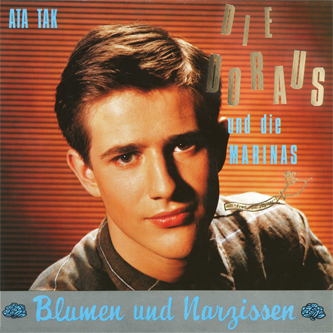 Thirty years since original release, Andreas Dorau's charming and infectious 'Blumen Und Narzissen' album as Die Doraus und Die Marinas reveals an incredibly pop-savvy touch full of prime melodies and bubbling electronic production with a really sly edge reminding of his peers Palais Schaumberg and Der Plan et al. It's made all the more fascinating by the fact that Andreas was 16 when he made it. Highlights include the brilliant 'Fred Vom Jupiter' (which sold 20,000 in a few months on initial release in '81) and the stepping, dubbed-out weirdo pop of 'Arrividerci', while six bonus tracks should make this a very enticing prospect for the synth-pop/Wave connoisseurs.